Oh, you have a Ford Raptor? A murdered-out Chevrolet SS? One of the last Dodge Vipers? Congratulations. Your car isn’t anywhere close to being as menacing as this 1989 Tatra 613—especially since it was allegedly owned by the KGB. We found this weird gem on eBay today, and I have to tell you it’s one of the most intimidating vehicles I’ve ever seen. For whatever reason, it’s for sale out of Cherry Hill, New Jersey, but its homeland was the Soviet Union, where it apparently served Mother Russia’s KGB proudly during at least part of the Cold War. The Tatra 613 was a rear-engined sedan built in what was then Czechoslovakia from the mid-1970s to the mid-1990s. In that rear trunk you’ll find a 3.5-liter air-cooled V8, which must be a most wonderful-sounding motor indeed. 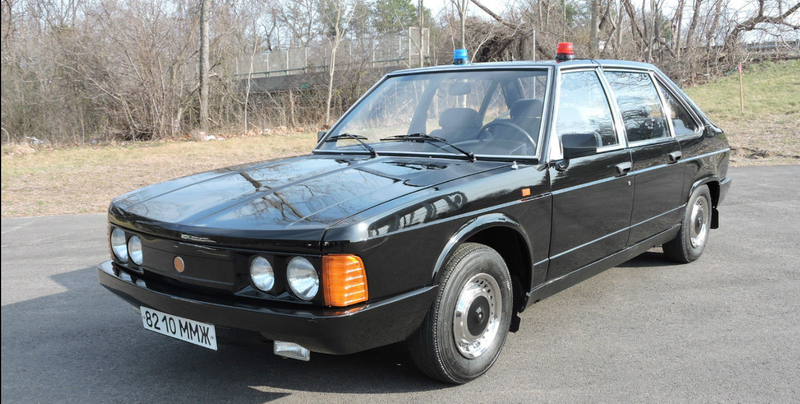 The 613 was popular among government officials and in law enforcement, including the KGB. This 1989 example on eBay has just 25,000 km on the clock and, as of this writing, has bids under $7,000. How the hell you’d go about repairing and maintaining this thing is beyond me, but it’s a great find for any collector willing to own an unusual piece of Eastern European automotive history. 1989 Tatra 613 KGB Staff Car. Extremely Rare Find. Completely authentic down to the KGB License Plates and even Tires. Working Lights and Siren. Excellent Condition Throughout. Runs, Drives, and Looks GREAT! This Tatra is a technological marvel in itself, nevermind its history. Each Tatra 613 was Hand-Built in Chechoslovakia durig the Communist Era for various special Government use, and was never available for sale to to the general public. This one was specially built for the Soviet KGB and includes Russian Market and various Secret Police/KGB options. Rear Engine, 200 HP, 3.5 liter Aircooled V8. 4-speed Manual Transmission, Dual Independent Gas Heaters, etc, etc.., Special KGB equipment includes unique Quick-Disconnect Magnet Mounted Roof Police Lights for Undercover Operations, Hidden Undercover Siren with Euro-Tones, Wail, Yelp, and Air Horn, Removable Magnet-Mounted Antenna, Hidden Kill-Switch, Service Booklet and Manual in Russian, etc.. Completely, stringently, and thoroughly serviced and maintained by the Russian KGB throughout its service life. With only 25K original documented km (only 15,500 miles) the car is in a fantastic shape throughout. This car is a piece of automotive and cold-war history and a worthy addition to any collection.